It is relatively hard to precisely say, as food component levels and requirements differ for each dog. Weight, age, breed and the physiological status (condition) of any dog are the simplest indicators for defining an energy level, which is attained by a high energy dog food. 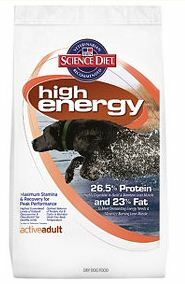 Moreover, in certain health related issues such as renal diseases (kidney), anorexia, starvation and approaches to gain weight may involve the use of high energy dog food. Plus there is more weight variation in terms of what is considered to be normal between species of dogs than in any other animal. Even if the ratio of energy content and levels differs for different dogs, the AAFCO (Association Of American Feed Control Officials), the dog food industry body that sets standards, has formulated minimum requirements for a quality higher energy dog food. The following are the descriptions for different nutrients on basis of levels approved by the AAFCO. This table shows the minimum requirements of a quality dog food with higher levels of energy, as certified by AAFCO. Manufacturers however may add other components. A good source for comparing foods is made available by the Ohio State University College of Veterinary Medicine. Canine food manufactured for dogs with an energy requirement is mostly indicated for overcoming any health issue in dogs. It cannot be given as a regular food for longer periods of time. In some exceptional cases, it is used for enhancing physical capabilities in race, working or hunting dogs, but that too is considered as supplementation only. For health issues like renal diseases (kidney), muscular atrophies, extended anorexia, starvation, lethargy and acute weight loss etc. high energy canine food is used to overcome symptoms and to support declining physiology (body condition). High energy food for d is also indicated in some weak and under weight pregnant female dogs to enhance the health status of not only dam but the fetus as well. High energy canine food is meant for providing excessive energy to the body, which can be either consumed or is stored in the form of fat. Along with other components of a balanced diet for different dogs, some ingredients are approved as the standard for being part of this type of dog product. These nutritional components usually provide AAFCO's approved ratio of different nutrients as proteins, fats, fiber etc. Chicken meal, Corn Gluten meal, Poultry fats, Rice and beet pulp are common active ingredients found in a standard high energy canine food. They provide more energy with levels of proteins that are maintained at the 30 – 32%, levels as approved by AAFCO. Commercially available products are formulated with the approval of the AAFCO only. To ensure that other nutritional needs are met, these producst also include other essential and non essential components as well. These are additional components to the aforementioned ingredients, which makes this food more palatable, enhances physiology and is considered friendly to the digestive tract. In addition to a dog's food, natural remedies such as Energy Tonic can help with a lack of dog energy or for dogs that need more. Natural remedies are helpful in maintaining optimum digestive levels towards this type of diet and to maintain digestive health as well. There are several commercial manufacturers that market dog foods which are labeled for dog with higher energy requirements. Again, these are for working dogs or for dogs that for medical reasons are using a food packed with more energy under the direction of a veterinarian. Hills Science Diet HIgh Energy - this product contains 26.5% highly digestible protein to build muscle and 23% fat to keep the body using fat for energy instead of burning muscle for energy. Diamond® Hi-Energy Sporting Formula Dog Food - Meat based product with Chicken by-product meal, ground corn, rice bran, wheat flour, chicken fat (preserved with mixed tocopherols), meat meal, beet pulp, natural chicken flavor, fish meal, vitamins and minerals to support working/sporting dogs. Ol Roy High Performance Dog Food - Good option available in Sams Club and Wal*Mart stores. A balanced diet should be used for healthy dogs. High energy canine food is never recommended to be used for long term, regular use and is also never used without the proper monitoring of a veterinarian. High energy dog food is usually prescribed only after conducting several tests like those for food allergens, obesity, cardiac strength etc. Diabetic and obese dogs should never be given a high energy diet. It should not be provided, even if an owner wants to increase the weight of his/her healthy dog. It is recommended that high energy dog food only be used based on the recommendations of a veterinarian.